Jiacheng Xiong appeared on Show 275, recorded in August 2013, at age 15. Jiacheng Xiong (piano), 15, is originally from Nanping City, Fujian, China, but he currently studies at the Curtis Institute of Music where he studies with Robert McDonald. This summer, he is studying with Veda Kaplinsky while at the Aspen Music Festival and School. In 2004, at the age of seven, Jiacheng was awarded first place for the 10thÊÒXinghai CupÓ award and was also given the Chinese Works Performance Award for his excellentÊpresentation. 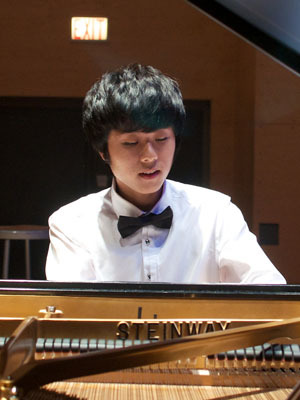 He also received second place in SteinwayÕs 4thÊYouth Competition. He has performed many times from the Fujian Nanping theatre to the CarnegieÊHallÊConcert as well as performances with the Philadelphia Parliamentary Assembly.